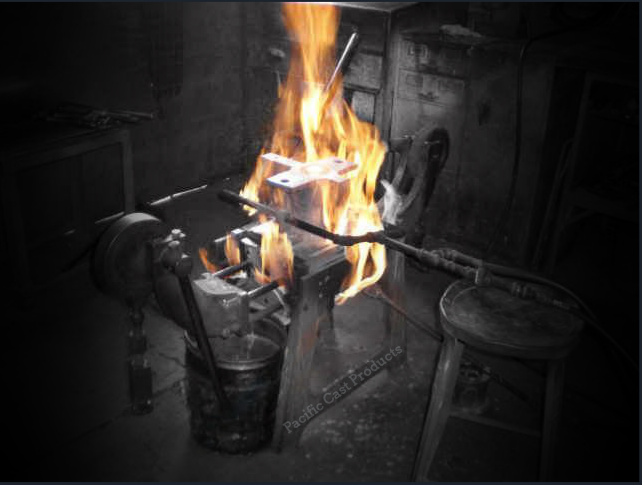 Permanent mold casting is accomplished through the use of an iron (typically cast iron) mold. The use of permanent molds, while somewhat costly to initially build the mold, benefits from a lower per casting cost on longer runs and complex parts can be made with much better quality and repeatability. When designing a permanent mold the following should be considered when engineering the part to be cast: minimum wall thickness of -.125 inches for distances less than 3 inches and more for longer distances, minimum inside and outside radius equal to .125, minimum draft angle of 1° on outside surfaces and 2° on inside surfaces should be heeded to promote a good design. Typical tolerances .020 on the first inch and .002 per additional inch as accuracy guidelines. Typical part sizes range from 1 ounce to 20 lbs. and more. Much larger parts can be cast using a permanent mold if the quality required justifies the cost of building the tooling. Permanent mold castings are gravity-fed and the pouring rate is kept quite low. The metal mold causes rapid cooling. This supports a relatively quick cycle time to using the mold and helps to achieve a lower casting cost. Permanent mold castings provide excellent mechanical properties when made with an appropriate alloy. The mechanical properties of permanent mold castings made with certain alloys (for instance A356) can be further improved by heat treating. Heat treating brings these alloys to full strength and hardness.